Sunlight from a set of sliding glass doors illuminates Jen Ownbey’s 250-square foot commercial kitchen in the retrofitted garage behind her house in a Westside neighborhood. Her only work surface is jumbled with metal bowls and pots at the moment, full almost to overflowing with chocolate ganache or cookie batter. Raspberry sauce licks the brim of an eight-quart stockpot. Ownbey stirs one thing or another the whole time we talk. It’s almost two-o’clock and, in fact, every surface in the 8 Arms Community Bakery kitchen is covered with pans of brownies, loaves of bread, hamburger buns, and cooling pans of bar cookies. The walls, where you can see them behind racks and shelving units, are painted with whimsical flowing shapes in turquoise, bright yellow, and orange, reminiscent of the arms of the cephalopod on Ownbey’s logo. Jen Ownbey, owner of 8 Arms Community Bakery, has a roster of goods totaling more than 150 items. She tells me she admires the octopus for its intelligence but also chose it because she thought it would be an apt symbol for nature of her work. 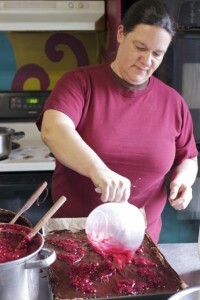 Ownbey left a teaching career in 2007 to start the bakery, which began with a share structure, similar to weekly community-supported agriculture (CSA) box programs used by local farms. Though functioning as a personal baker still appeals to Ownbey, she sells about half of her goods through her wholesale accounts. The business has also grown in ways she didn’t forsee. About a year after starting the business, for instance, she made some gluten-free bread at the request of a friend. Word got around, and soon she was receiving requests for more. Now, about 40 percent of her overall sales are comprised of her gluten-free cookies, breads, pies, cookies, and bars. Ownbey’s space is compact and though she doesn’t have the funds to create a second kitchen dedicated to gluten-free baking, she bakes her gluten-free items before traditional goods to minimize ingredient crossover. 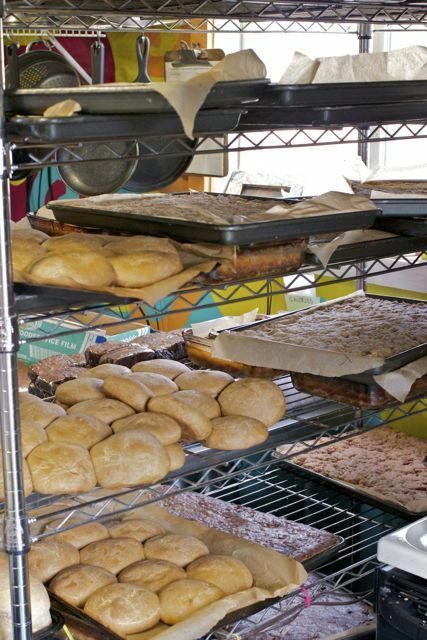 The 8 Arms Community Bakery utilizes every inch of available space. For her traditional and gluten-free items, Ownbey purchases organic flours and sugars and prioritizes local ingredients whenever possible. Her eggs are from Stiebrs Farms in Yelm. In the summer, she sources zucchini, potatoes, and other produce from area farmers. Just outside the sliding glass doors, she keeps a backyard garden where she grows rosemary, kale, and some of her own potatoes to use during the busy summer baking season. In the spring, summer, and fall, Ownbey’s goods are sold at the farmers’ markets in Tumwater, West Olympia, Shelton, Tenino, Yelm, and Lacey. She also sells at the market in Seabrook, on the Washington Coast. Retail outlets include the Olympia Food Co-op, Olympia Local Foods, The Food Nook at Fertile Ground, Healthy Benefits Market, Method Coffee Bar, Traditions Café and World Folk Art, and many more. She also provides hamburger buns for Darby’s Café and has a new account with Mason General Hospital, where her pies, bars, and cookies are sold in the cafeteria. Subscribers pick up baked goods at six different drop sites in Olympia, Lacey, Tumwater, and Shelton on Wednesday afternoons. The bakery’s roster of goods includes over 150 different goods. She makes 11 types of gluten-free breads, 10 slicing bread varieties, 22 different bars, tarts in 13 flavors, and specialty items including homemade crackers, cheesecakes, cinnamon rolls, macaroons, and granola. She says some of her most popular flavors are her specialty breads, such as gorgonzola olive. 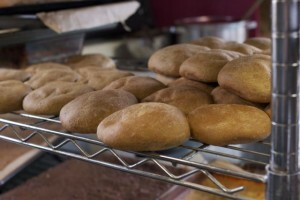 Hamburger buns, one of the items baked by 8 Arms Community Bakery, are likely headed for Darby’s Cafe in Olympia. The wide array of products parallels the growth of her company. But it also points to Ownbey’s philosophy as a baker: to cater to businesses and individuals by customizing orders. “If you want it, I’ll bake it,” she says. About two years ago, Ownbey made the shift from a one-person operation to multi-employee company. She still makes the majority of the baked goods herself (she bakes five days per week) and handles all wholesale and subscriber phone orders. But now she’s added three employees (and more in the summer) who help with packaging, deliveries, and farmers’ market stands. One employee bakes on Sundays. 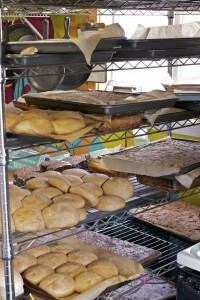 Contact 8 Arms Community Bakery and Jen Ownbey at 360-754-6894 or jen@8armsbakery.com.